Good Monday morning to you! Thanks for stopping by! I hope you had a great weekend. We had absolutely beautiful weather here, and enjoyed a lot of time outside. I love Spring!! Speaking of which, I joined the Spring Reading Thing 2010 challenge this weekend, which I hope will give me more motivation to read, read, read! I completed a couple of books last week. The first was Our Promised Land by Michael T. Darkow. This was a wonderful novel about two families ~ one Jewish and one Palestinian ~ and their experiences during the formation of the nation of Israel. I'm giving away two copies of this book, so be sure to enter my giveaway. It ends tonight at 10:00pm EDT. The other book I completed last week is Wench by Dolen Perkins-Valdez. This was another great book about four slave women who accompany their masters to a summer retreat in an area of the North that is free. You can click on the title to see my review. Julie you are so chipper! Your post made me smile! I have to read your review of Wench. I have it yet to read. I have to read The Piano Teacher again next month for book club..I'm hoping it's better the second time around! They sound very interesting, I am glad you enjoyed them. I've heard great things about Wench, but I don't think it's made it onto my list yet. You've reminded me to add it! Enjoy your books! Here are my books for the week. Your books look wonderful! Enjoy! Our Promised Land sounds so good, wish that I had gotten here in time to enter your contest. I honestly don't understand what is really going on there and I know that I learn better when I read first person accounts as opposed to dry straight non fiction. 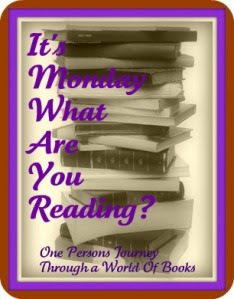 Love the "What My Children Are Reading" idea! Just fabulous! And it looks like a fun week ahead for you! Enjoy! And have a fabulous reading week! I haven't heard of any of your books listed here - but they all sound very good! I love learning about new books. And thanks for listing my blog on your blogroll!